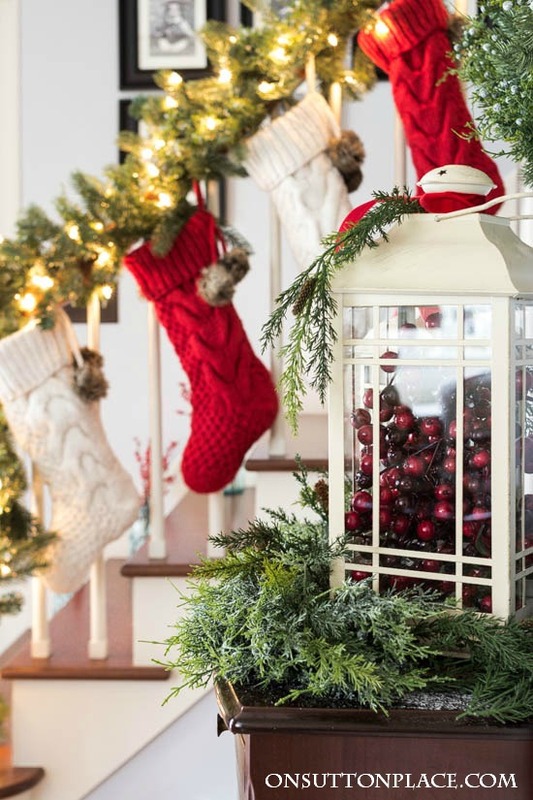 Today I’d like to welcome you to Home for the Holidays: Tree Classics’ Christmas Housewalk, where I am featuring my Christmas entry decor along with a few ideas for adding some Christmas cheer to any space in your home. 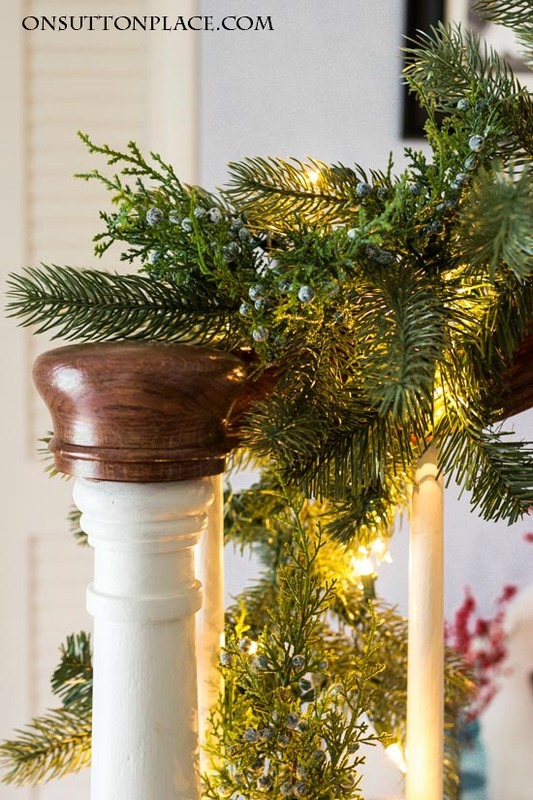 Simple touches that anyone can do that feature pine garland, juniper and winterberries, ball jars, lanterns and more. I know this look isn’t for everyone…especially if you have kids or large dogs…but when I saw these winterberries at Kroger I couldn’t resist. I brought home two bunches and when I put them in the ball jars I knew right where they were going. This is a look that’s easy and you can use it anywhere. Coffee tables, down the center of your dining table, a mantel or bookshelf. Next is the stairway banister. I am featuring a Classic Noble Fir pine garland from Tree Classics that came lit and ready to hang. Even though this garland is full and can stand on its own, I wanted to carry my juniper berry theme from the front porch to the entry. I added some bunches of berries to the stairway garland after it was hung. 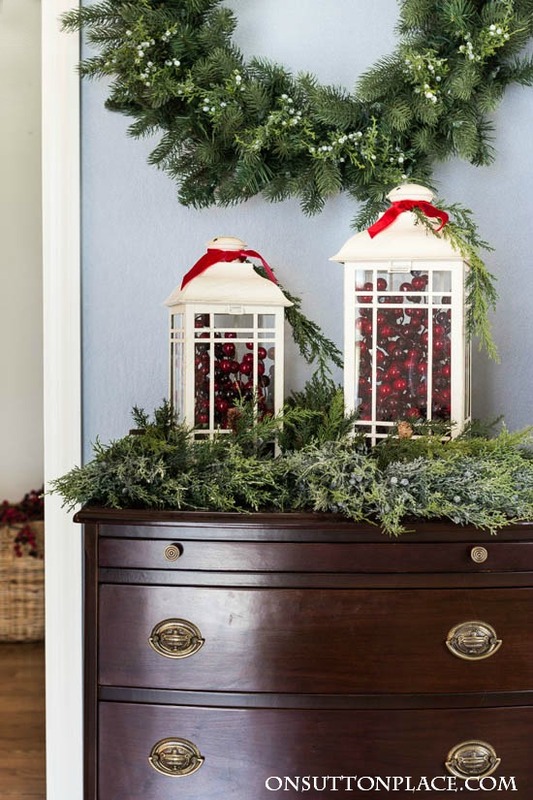 If you have room in your entry for a small table or chest, it’s the perfect place to add some Christmas cheer. I gathered my trusty lanterns that I’ve had for years, some pine pieces, faux cranberries and a little red ribbon. This type of thing really doesn’t take any time at all and it’s not an exact science. Start with two or three “vessels” in different sizes. They can be lanterns…but you could also use vases, urns or pitchers. Next add any kind of pine (preferably some you already have) and just place it around your vessels. Last, fill the vessels with something colorful. The Classic Noble Fir wreath above my table matches the garland. Again, I added a few juniper berries so everything ties in together. 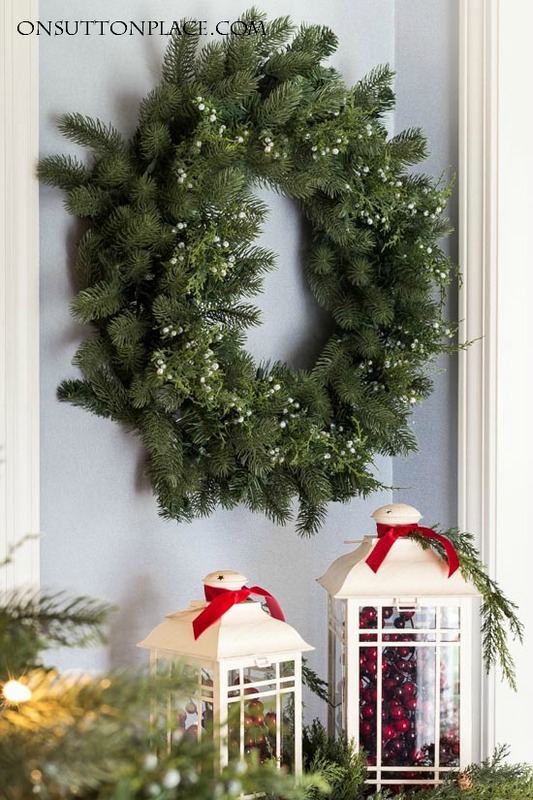 This is the 24 inch wreath which is actually on sale right now, as is the garland. Before I go I want to tell you about the Tree Classics 12 Days of Christmas Giveaway. 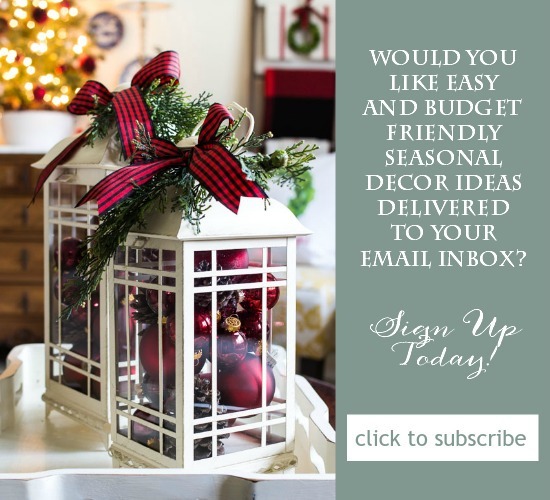 They are giving away pieces from their premium holiday decoration collection…one prize per day for 12 days. The giveaway started December 1 and runs through December 12 (when they’re giving away a tree!) so there’s still plenty of time to enter. Click HERE for more information. * As you all know, I rarely do sponsored posts but I enjoyed working with Tree Classics very much. I was compensated with the products featured in this post and all opinions are my own. I love your Christmas decorations & your decorating style is to my liking. May I ask–where did you purchase the white lamps in your living room? Beautiful. just beautiful. The space is so welcoming. It’s all very, very festive and lovely Ann!! Happy happy holidays!! Ann, it’s all so pretty! I love your Christmas house and happy you joined me in this tour. You have a wonderful knack for putting things together! 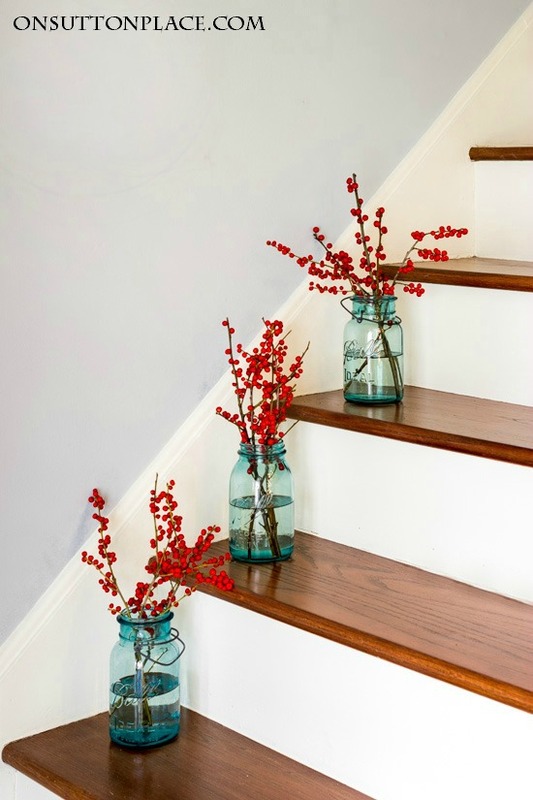 Love the Mason jars on the stairway. So simple, yet so pretty. Love the red berries in the blue jars! Gets me every time! It looks lovely! Simple and beautiful. Your style is just the BEST! 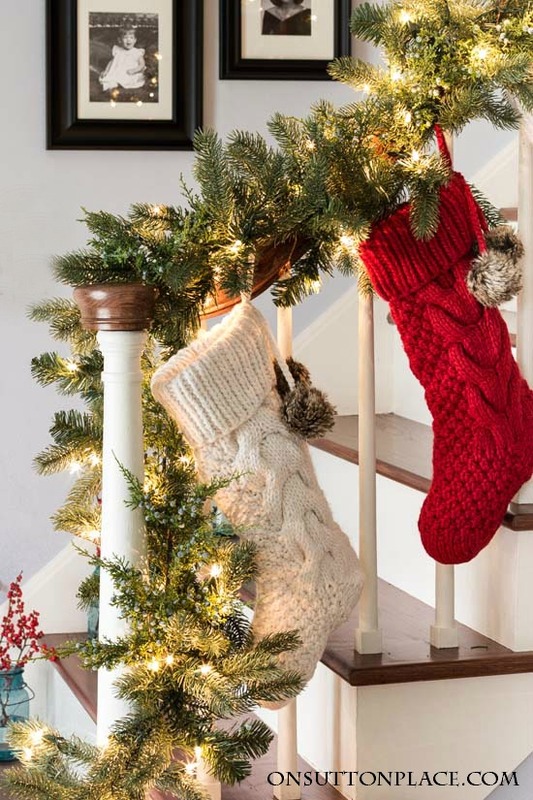 Love your choice of Christmas stockings! They will never go out of style and bring a great punch of color to the evergreens. As usual you have done a stunning classic look which I just love. I like the accent of juniper berry to the pine, great idea, thanks for the link. Do you normally have a mirror where the wreath is so you have a nail in the wall? What a wonderful way to greet those who enter your home! And what I love is that is was simple to put up and easy to store. Everything can be used in multiple ways another year, but it would be tempting to keep “a winner” combination that you have achieved this year! Yes I do usually have a mirror hung in the entry so the screw was already there! Your entryway is beautiful! I love the cups full of red berries! 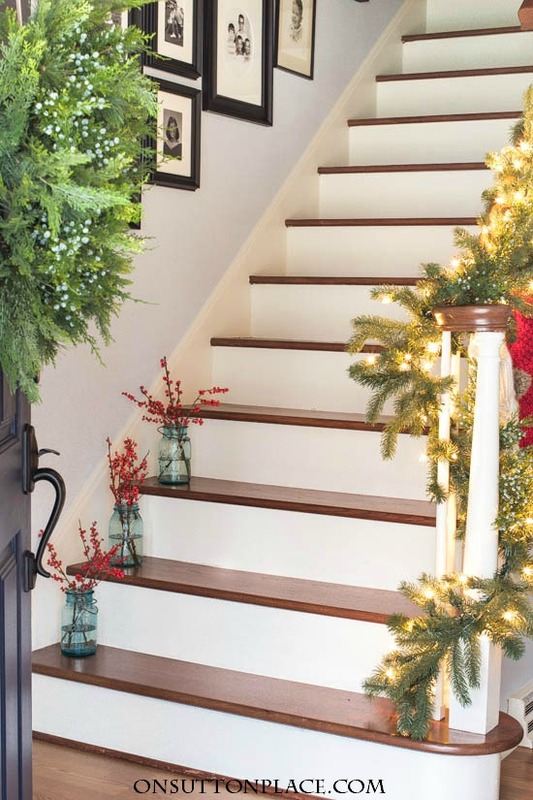 Your entry and stair rails are just so pretty, Ann! I love all you do. Classic Christmas greens and berries, love it! Ann your decorations are just beautiful. I too love the berries and this year I added in my décor red cardinals which I incorporated into my wreath. My bay window has the green garland along with snow covered picks with berries, I also weaved a strand of led colored lights and its so pretty at night. As always, thank you for sharing your wonderful decorating ideas and I am making the oranges with cloves this weekend. Beautiful! I love your simple touches that can make anyone feel cozy and welcome! It looks amazing, love all of it! How pretty Ann! I love those winterberries! I love the look of the winterberry but haven’t seen any! Is there a nice faux version out there? Thanks so much for sharing your great ideas! Love the use of greens and berries. I feel I have a new friend and so look ahead to what you bring to the new year. Best Christmas wishes to you. Ann, everything is so pretty. I love all the greenery with the pops of red. Beautiful Ann. Always love to visit your home via the blog. Thanks for the inspiration. Your decorations look beautiful. 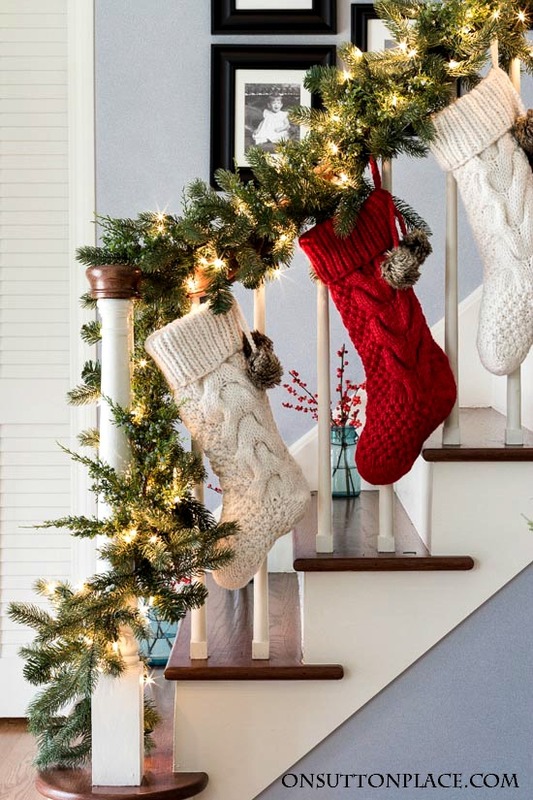 Love the garland and stockings on the banister. Love the white lantern’swith the red berries. I would love to see your home in person. Very inviting. Have a wonderful holiday. I love visiting Sutton Place. You have such wonderful ideas and easy to follow directions…..